Published: 2005 by McClanahan Publishing House, Inc. If I had to choose one word to sum up this book, it would have to be...sophisticated. Seriously, this was a pretty awesome book. 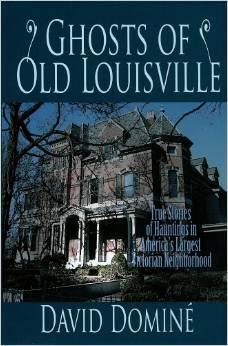 David Domine is a resident of Old Louisville, a huge Victorian neighborhood in central Kentucky. Through beautiful writing, David tells the history of his unique neighborhood and the tales of ghostly residents that still reside therein. Included on that list is David's own home and the steps he had to take to ensure a peaceful existence of cohabiting with the other side. While the stories are primarily from private residences, there are a handful of locations that are open to the public, such as the Speed Art Museum and Central Park. There's even a brief write-up of Waverly Hills, because no book about the ghosts of Louisville could be complete without at least a mention of the famous tuberculosis hospital. I personally really enjoyed this book. It was the perfect blend of historical fact and story-telling. As an added bonus, there were plenty of photographs to really illustrate the beauty of this historic district. While Old Louisville is now a protected historical district, in the 1940s, the neighborhood saw a lot of neglect and decline. David and so many of the other current residents that he interviews and shares stories from have really taken great pride in returning the neighborhood to a sophisticated, upscale example of Victorian style---that passion and dedication certainly comes through in the writing. I'd definitely recommend this book as a welcome addition to any library of Kentucky ghost stories, but I think anyone who has an interest in the Victorian age, history in general, or simply just a good ghost story can get a lot out of this book as well. I know I'll be keeping an eye out for this author's other books!